The UA Transport System stabilizes urine samples for up to 96 hours with no change in pH or specific gravity. The system comes complete with a conical style tube, push cap, instruction label and preservative tablet, which does not contain mercury. Beaker cup sold separately. 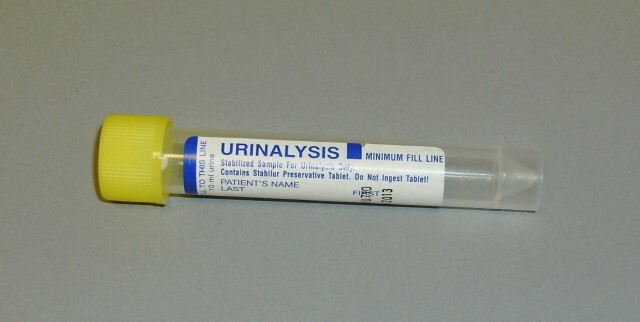 The 10 mL Urinalysis Tube comes with a Tartaric preservative tablet to preserve urine specimens at room temperature for up to 72 hours. The preservative maintains an acid pH and prevents bacterial proliferation, thereby preventing false positive readings for occult blood and protein. Also, the identification of formed elements, such as cells and casts, which are enhanced while in vitro crystal formation is prevented. Pathologic components are not obscured. Externally threaded with yellow screw cap & affixed with label for recording patient & collection information.